Kona and sister on final slopes below summit on a snowier than usual mid-April day. Gizmo (10-11 years), recovering from pit bull attack, on Ha Ling on a windy but sunny January day. Kona behind. Kona with wind jacket on a blustery late November ascent of Ha Ling. Shelly (10 yrs old) from Austria on HaLing Peak in early fall. East End of Rundle behind. Below on Miner’s Peak and Little Lawrence Grassi? with Kona, view back to HaLing Peak. More snow than usual in early April on Ha Ling Peak. East End of Rundle behind. Kona (2 yrs) on Miners Peak near Canmore in haze from BC and Washington State forest fire smoke; Ha Ling Peak and EEOR (East End of Rundle), two of the Triple Crown of Canmore peaks behind. Good views of climbing parties on face of Ha Ling from here. Below Kona (3 yrs) with Karin on Miners Peak while doing Ha Ling for the Triple Crown. 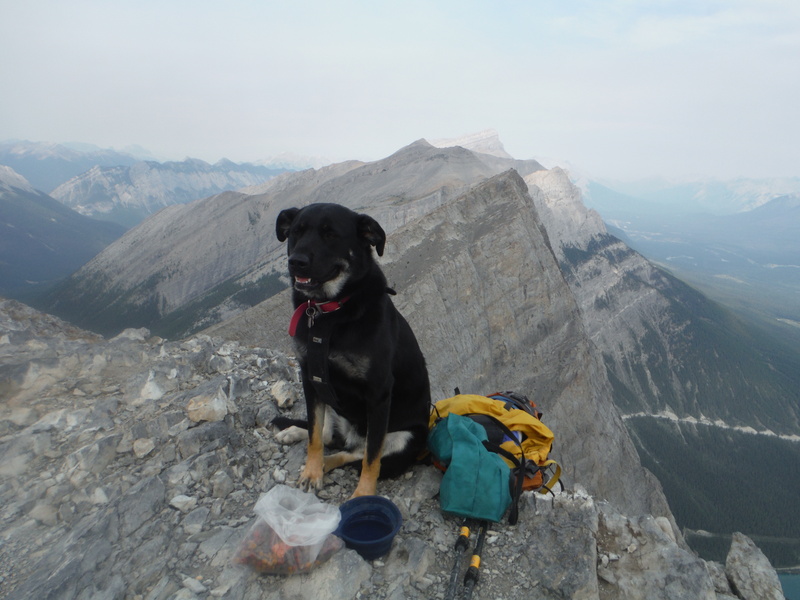 Buddy (8 yrs) & Kirsten (19 yrs) on Ha Ling Peak (one of the Triple Crown of Canmore peaks). Late spring snow blanket.